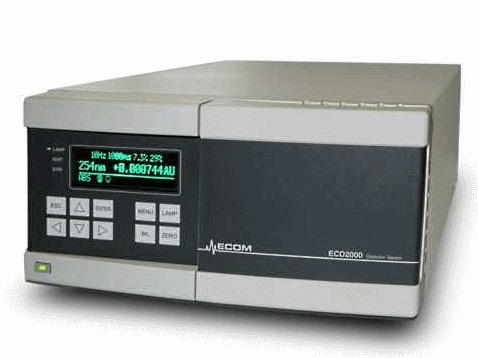 ECD2600 and ECD2800 Variable Wavelength UV-Vis Detectors for HPLC applications with variable wavelength from 190 nm to 600 nm (ECD2600) or 800 nm (ECD2800) and high speed sampling up to 100 Hz. A large number of available flow cells allows the use of these detectors in preparative HPLC and in Flash Chromatography. Also available in ECD2600 EX and ECD2800 EX versions with optical connectors, allowing connecting external flow cells using fiber optic cables with SMA connectors. Call Rose Scientific for information on the the full range of flow cells and external flow cells available and their characteristics. Inquire about the ECD2600 CE version designed for use in capillary electrophoresis (CE). Newly developed cell enables easy installation of quartz capillaries and minimizes interference by ambient light as well as mechanical shocks. The light is brought into the cell using optical fiber, which is focused in the center of quartz capillary for electrophoresis. Capillary electrophoresis is a modern separation method for analysis or micro preparation of substances. Separation of components in a solution occurs due to effects of an electric field in a quartz capillary. An advantage of capillary electrophoresis when compared with HPLC consists in particular in miniaturization of the separation area, in higher analysis speed, higher separation efficiency and higher selectivity.